Be The Match, the national bone marrow donor registry, will be on campus on Wednesday, Nov. 2 for a bone marrow donor registry drive. 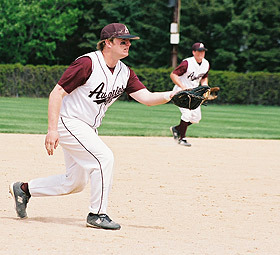 This year, Be the Match will be aided by the Auggie baseball team, including assistant coach Troy Deden '07, a transplant recipient. Deden [pictured here] was diagnosed with leukemia in 2008, after he had graduated and had joined the Augsburg coaching staff. He went through treatment for eight months, missing an entire baseball season, and was in remission for nine months following chemotherapy. Then, the leukemia returned. "The only thing to do at that time was to have a bone marrow transplant," Deden said. Neither of his two sisters was a match, so he was put on the recipient list. Eventually a donor was found, a "perfect" donor who matched Deden on all HLA (human lukocyte antigens). "Now it's been two years since my transplant, and things are going great." Deden is in the process of trying to contact his donor and to meet if the donor is willing. Deden said that when he returned to the coaching staff after his treatments, the entire baseball team was an important source of support. "I needed them to help me go on and have a somewhat normal life," he said. Head baseball coach, Keith Bateman, became aware of the program through work he has done with the Minnesota Twins, specifically with Rod Carew, who is active with the donor program. Bateman attended a gala for Be the Match last year and was very moved by stories of donors and recipients. He heard of the program's pressing need for donors of color, and he thought Augsburg would be an ideal location for a drive. Bateman asked Deden if he would be interested in promoting a bone marrow donor drive at Augsburg, and Deden was more than willing. He wanted to get the entire team involved in the drive, so at the November drive the players will help register donors and raise awareness about the program. Bateman said, "I think this is just the right thing to do." "Before I got sick, bone marrow transplants were just a thing I had heard about," Deden said. "Now, anything I can do to help, I want to be a part of it. It saved my life and many others." The Augsburg bone marrow donor drive will be Nov. 2 from 10-4 in the Christensen Center lobby. Be the Match is in need of donors between the ages of 18 and 60 who meet the health guidelines, particularly racially or ethnically diverse donors. Learn more about bone marrow donation at Be the Match.